Queen (Dronning) Sonja of Norway celebrates her 70th birthday in Stavanger today, with a tour of the town, lunch at Hall Toll and dinner at Flor og Fjære. With her are King Harald and the rest of the royal family. The weather smiled too, with the rain staying away, and the sun peeping out at the parades. Arriving and leaving on the royal yacht, KS Norge, in vaagen, the main harbour, the party walked along to Torget, the market place which has just been rebuilt in white granite where a copy of the Andy Warhol portrait of her from 1982 - made of flowers - was unveiled. The car-free cobbled streets of Stavanger were filled with thousands of well-wishers for the event, and we think it would be a great idea for you to come here and follow the Queen's route. 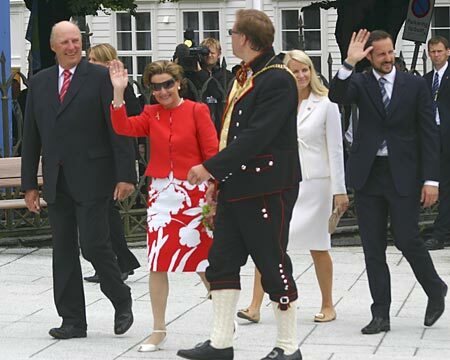 In the picture you can see (from left to right) King Harald, Queen Sonja, mayor of Stavanger Leiv Johan Sevland, Princess Mette-Marit and Crown Prince Haakon.